Nearly half of Latinos (48%) say they discuss global warming with family and friends at least occasionally, while more (52%) say they rarely or never discuss it. 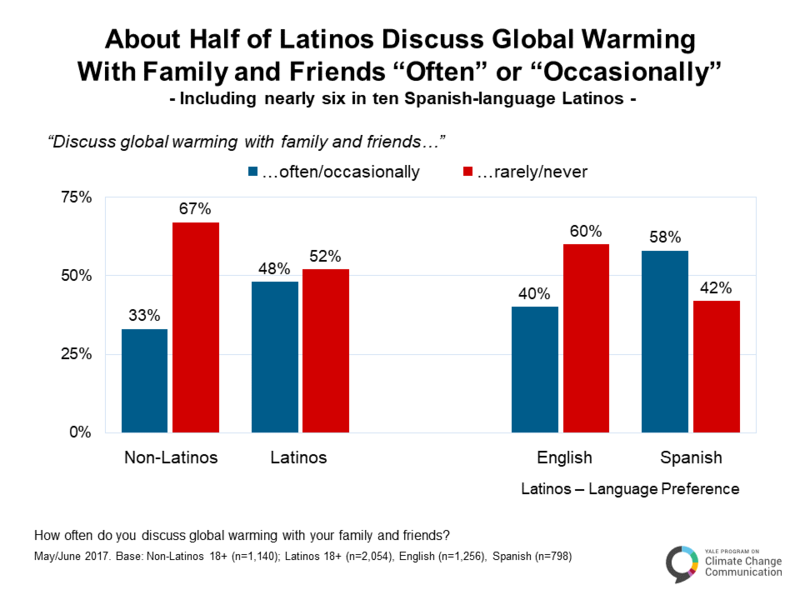 A majority of Spanish-language Latinos (58%) say they discuss global warming with family and friends at least occasionally. By contrast, two in three non-Latinos (67%) and six in ten English-language Latinos (60%) say they “rarely” or “never” discuss global warming with family and friends. A.4.2. Fewer than half of Latinos hear about global warming in the media at least once a month. Only about four in ten Latinos (41%) hear about global warming in the media once a month or more frequently. About the same number of non-Latinos (44%) hear about global warming in the media once a month or more. 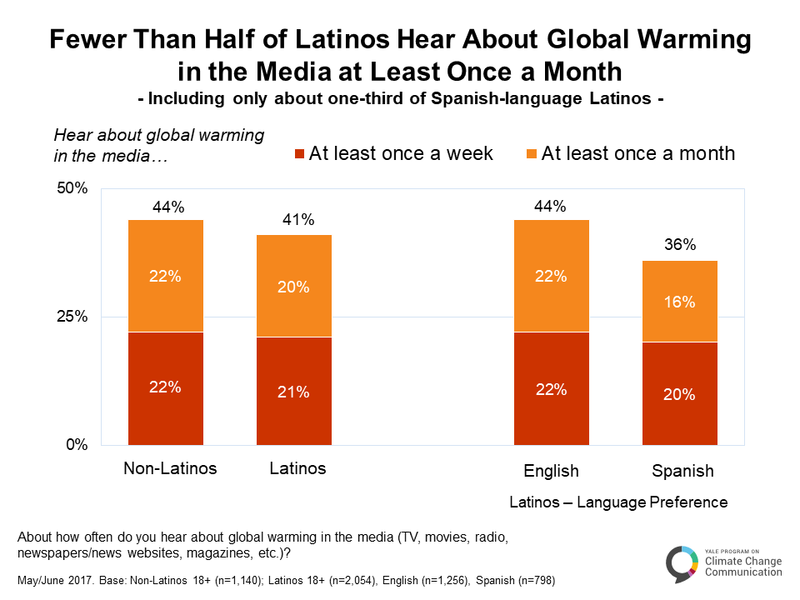 Spanish-language Latinos (36%) are less likely to hear about global warming in the media at least once a month. A.4.3. 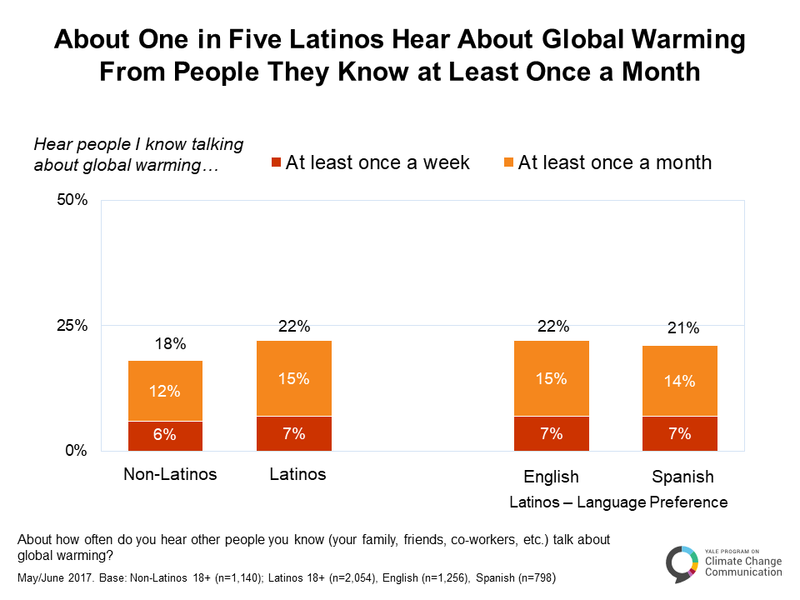 About One in Five Latinos hear about global warming from people they know at least once a month. About one in five (22%) of Latinos hear about global warming from people they know at least once a month or more frequently. Slightly fewer non-Latinos (18%) hear about global warming from people they know at least once a month or more frequently. A.4.4. Global warming is important to eight in ten Latinos. A large majority of Latinos (83%) say that global warming is at least “somewhat” important to them. 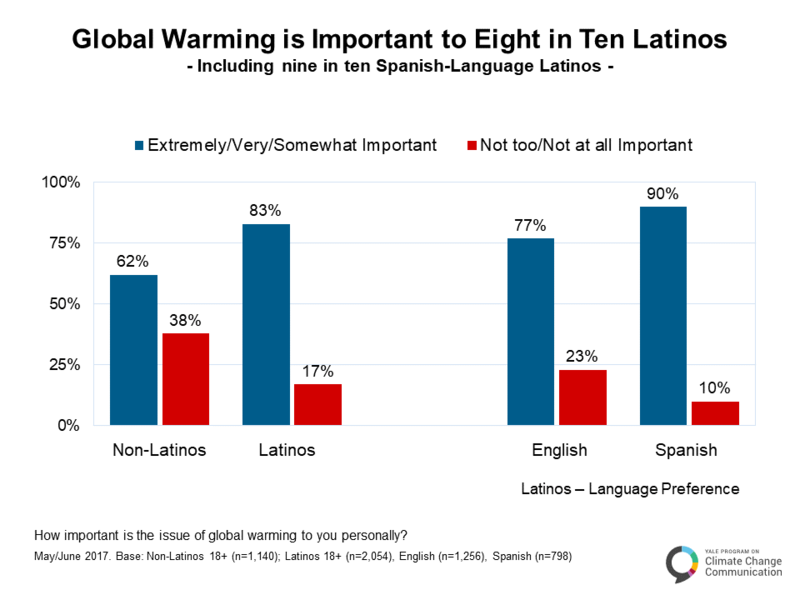 Nine in ten Spanish-language Latinos (90%) say global warming is important to them. Fewer than one in five (17%) say that global warming is “not too” or “not at all” important to them. By contrast, fewer non-Latinos (62%) say global warming is at least “somewhat” important to them, while nearly four in ten (38%) say it is “not too” or “not at all” important. A.4.5. 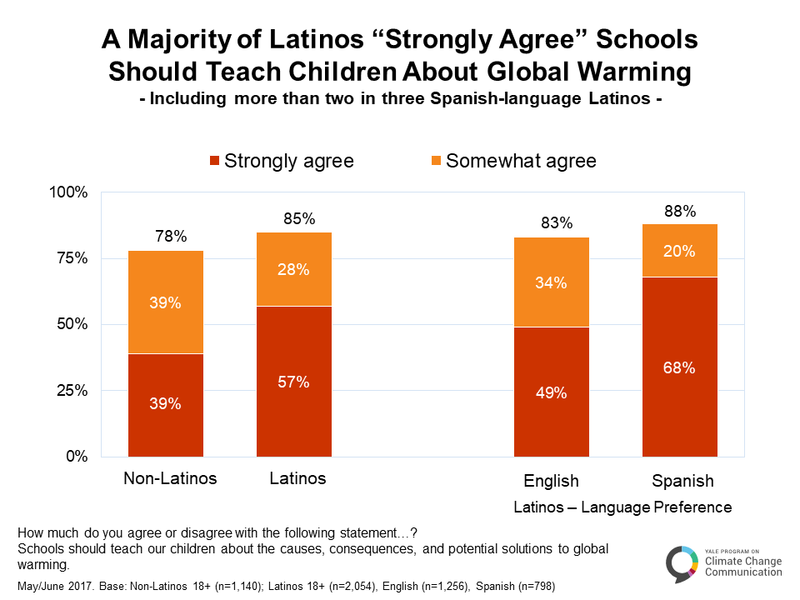 A majority of Latinos “strongly agree” schools should teach children about global warming. The Next Generation Science Standards for K-12 STEM (Science, Technology, Engineering and Mathematics) education in the U.S. The Next Generation Science Standards were developed by a collaboration of scientists and educators at the National Research Council of the National Academy of Sciences; the American Academy for the Advancement of Science; the National Teacher’s Association; 26 states; and Achieve (a non-profit organization). Released in 2013, the standards represent the most current, research-based method of educating K-12 students in STEM and preparing them for STEM careers. See: http://www.nextgenscience.org/ require that climate change be included in the curriculum, a mandate that is controversial in some parts of the country. A large majority of Latinos (85%), however, support teaching about global warming in schools, including more than half (57%) who “strongly agree” that schools should teach children about the causes, consequences, and potential solutions to global warming. More than two in three Spanish-language Latinos (68%) strongly agree that schools should teach children about global warming.